The Les Bleus had to overcome a good performance from Echo Park pitcher Will Hunting to claim a 5-4 win at Quebec City Coliseum. Hunting went 7 innings and allowed 1 earned run. Quebec City reliever Carlos Garza was credited with the win, to go to 2-0. Enrique Arrabal took the loss for Echo Park. The Les Bleus are off to a tough start, getting just their 4th win in 11 games. Kameron Guangorena was the walk-off hero for Quebec City. 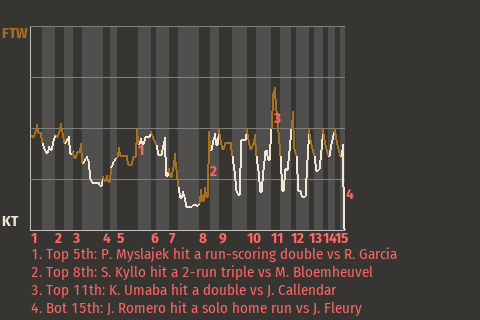 With the game tied in the bottom of the ninth inning, the Les Bleus catcher hit a dramatic run-scoring single to send the teams home. "Some of the guys in here work hard, some of the guys just kind of fall out of bed and get it done. Whatever works I guess, we won this one," Guangorena told the Quebec City Herald.